I came across this empty 1908 kohlrabi seed packet at one of our many antique stores here in central Pennsylvania and was smitten enough with its age and design to make the minor purchase. The five-cent seed packet was sold by De Giorgi Bros of Council Bluffs, Iowa. And the envelope itself was designed by Stecher Lithographic Company of Rochester, New York. According to "Nineteenth-Century Rochester Fruit and Flower Plates" by Karl Sanford Kabelac, "In the latter half of the nineteenth century, Rochester, New York, was a leading American nursery center. Auxiliary to the nursery businesses, there developed allied enterprises, one of which was the production of colored fruit and flower prints designed to aid nurserymen and their travelling salesmen sell plants." Stecher was one of the bigger Rochester companies involved in this enterprise. Again according to Kabelac, Stecher employed about 100 people for its lithographic business in 1888. "This large, many-rowed variety originated with V.H. Neilsen of Council Bluffs, Iowa, as the result of a cross involving Country Gentleman and Stowell's Evergreen. After 5 years of selection to obtain a stock with straight rows that still retained the depth of kernel characteristic of Country Gentlemen, the variety was transferred to the Di Giorgi Brothers of the same city who introduced it about 1917 and have since continued to list it." 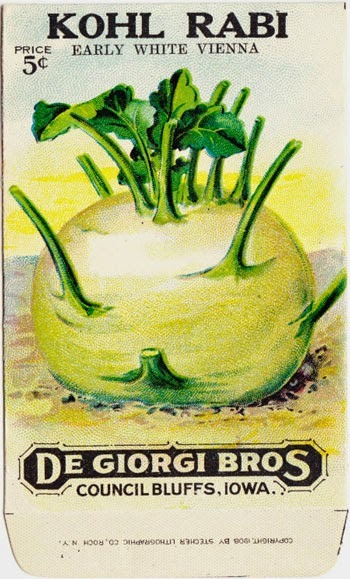 Some advertising literature from the general time period lists Early White Vienna as the most desirable variety of kohlrabi that was available. According to Wikipedia, the most common varieties of kohlrabi nowadays are White Vienna, Purple Vienna, Grand Duke, Gigante, Purple Danube and White Danube. So it appears that this variety once produced by De Giorgi has persisted. The interesting thing is that the seed instructions are printed in both English and Czechoslovakian. Czech immigrants flooded the Midwest and Upper Midwest during the 19th century and became part of the farming backbone of our nation. And so it was only natural the many products and services were offered with Czech translations. It also made the detailed color illustrations in catalogs and on packaging crucial for those who couldn't read English but knew what they needed. And that is part of what gave rise to the lithography business in the 19th century.